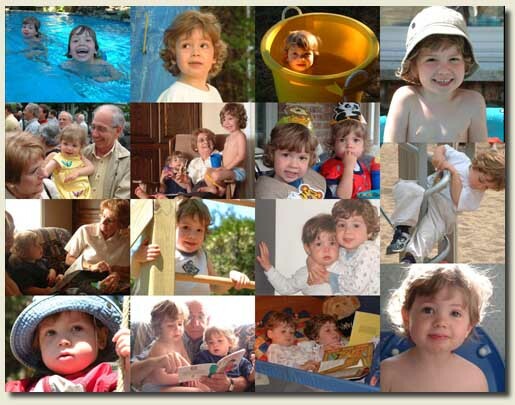 At present, LumaPix is offering a trial download of Collage Factory on their site, www.lumapix.com. Installation is a breeze and took less than five minutes. The setup file is just under 3 MB and takes up just about the same amount of space on your hard drive. No restart was necessary after installation was complete. Collage Factory works on Windows 98, 2000, Me and XP. Collage Factory’s interface is intuitive and easy to use. The program includes standard menu options. 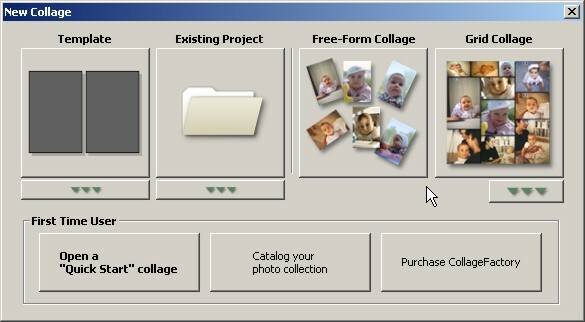 Under the file menu, you have the choice of render collage to file and e-mail collage. Under the view menu, you can customize the toolbars, set zoom levels, center canvas, reset image, etc. In the help menu, LumaPix has included links to updates, user forums, support, tutorial and more. 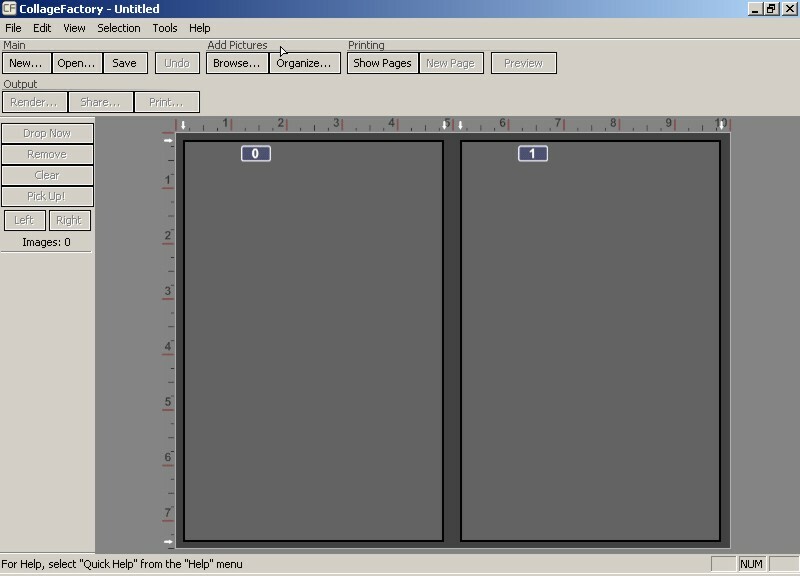 In the tools menu, there are extensive links to frame, image, canvas and dropper tools. I found Collage Factory very easy to use after only a few moments. I mixed clipart with photos on a collage and found the program very amusing. The crop, resize, merge, rotate, pan, split, pickup and zoom tools are inset within the image which makes it very simple to apply these features to your project. However, when you are first using the program it is hard to remember where each specific tool is located on the image and it can become a little confusing. Exporting is quick and easy and “idiot proof”, because when you render your collage to a new file you are able to type in what resolution you want and you are able to choose between JPEG, PNG, TIF, BMP, and GIF. You can save it in many different formats and resolutions and export it in different sizes to different people. So no more will you be sending an enormous image because it took too much time to change your format and resolution! And if you want to get back at someone who bogs your email with huge photos you can always send them a few collages! Another handy feature of this product is the photo catalogue. This allows you to store numerous digital photos within the selection manager of the program. This way when it comes time to make your collage you do not have to search through your image files, the program does it for you. However, the best convenience of the program and perhaps the most “idiot-proof” feature is direct emailing. With this feature you can directly email your collage without the hassle of attaching the file and having to worry about the format and resolution once again. The best way to begin your collage is to utilize the Quick Start feature which shows you what each tool does and lets you make a college out of the text blocks. After you feel you have mastered the tools you can create a new project. 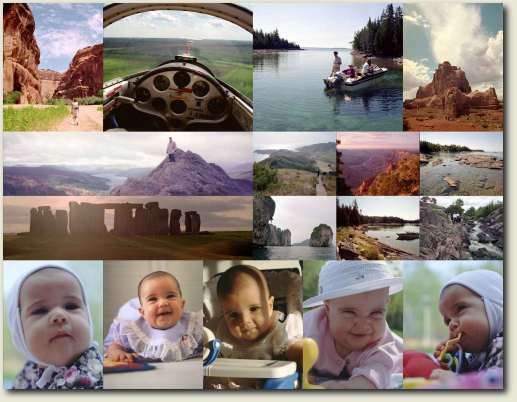 You can select to make your collage using a number of templates or you can create a free form collage. If you think you might want to make something that looks very uniform, then a template would suit you best. However, if you are interested in making something a little more artistic, the free form collage option is worth your while. After opening your new project, simply click on the browse button on the top right of the screen and open a picture. Once it is open it will appear on the side panel on the left. Next you can place it on your canvas in the center and use the inset tools within that image to create your ideal collage. 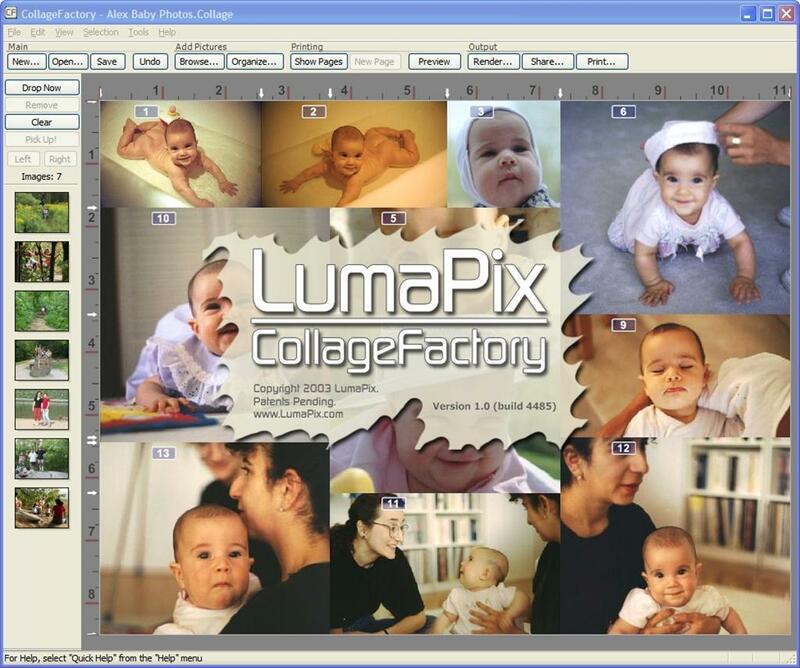 Innovative and ideal for beginners, LumaPix Collage Factory is a clever program. If you have a lot of pictures lying around and you would like to do something interesting with them but do not have a lot of time, Collage Factory is the ideal program for you. Although a little confusing at first (when trying to remember where the tools are located within the image), the program is overall very user-friendly and a lot of fun to use and is a recommended buy for home/personal users who do not want to buy expensive professional graphics packages.